You probably know that water is important for both your health and your looks. But why? What effects does water have on the body? Get the answers here! Did you know that your brain consists of nearly 80% water? It’s true! In fact, to function properly, your brain depends on a delicate balance between water and a variety of elements. Think of it this way: when you lose too much water (whether that’s not drinking enough throughout the day, or exercising and not properly hydrating yourself afterwards), your brain cells lose their efficiency. However, when you get the right amount of water, you may notice improved concentration, memory function and better sleep. Even though you may be blissfully unaware, your heart is constantly working – pumping about 7600 litres of blood a day. When you are properly hydrated, your heart pumps more easily. Dehydration, on the other hand, leads to a lower blood volume, so your heart has to work even harder to pump and deliver enough oxygen to your cells. This is when exercise often feels even more challenging than usual. How much water you drink has a direct effect on how energized you feel. 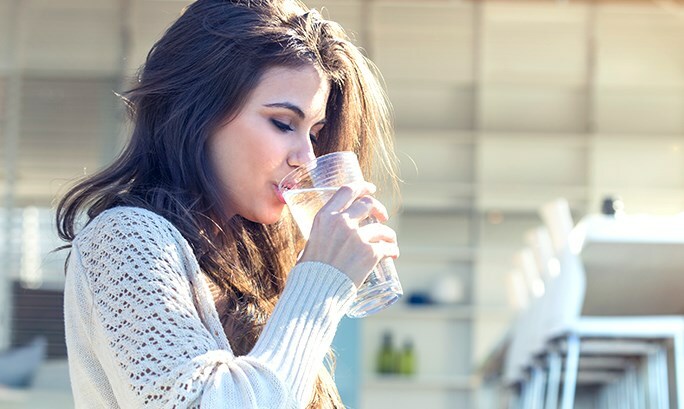 In fact, studies show that women who are dehydrated often experience a significant drop in their overall mood and energy. Instead of reaching for caffeine and sugar (which only cause your body to lose even more water), do your best to drink the real stuff. You might notice that if you don’t drink enough water, your skin starts to feel tight, dry, and even flaky. Hydrated skin, on the other hand, looks more supple and radiant. Why? Because proper water intake means increased cell productivity, leaving you with healthier-looking skin. One trick to further increase your skin’s hydration is to apply moisturiser on slightly damp skin (for example just after showering or washing your face), as it absorbs the products more easily.